Chicago Teachers Strike Post Mortem: Did the Children Win? If you were looking for balance in the mainstream press coverage of the Chicago teachers’ strike over the past few weeks, you looked in vain. It was kind of amazing how much virulent hostility the Chicago Teachers Union engendered by virtue of standing against the proposals of Chicago Mayor Rahm Emanuel. Most of the union’s grievances focused on Emanuel’s proposal that 40 percent of a teacher’s evaluation be based on student test performance. For all of the societal complaints about the dynamic in public education of “teaching to the test,” much of the impetus of educational reform efforts promulgated by foundations such as the Bill & Melinda Gates Foundation and by allied nonprofits is exactly that, with a few additional political agendas attached. Don’t take this essay as a full-throated, knee-jerk defense of the Chicago Teachers Union. Anyone who witnessed the debacle of the teachers union in Washington, D.C. and Miami saw horrendous union behavior aided and abetted for too long by the national unions turning a blind eye to what was happening at the locals. But it is also not a mindless attack on the unions as yet another case of unions protecting the interests of their members. The issues at the heart of the Chicago strike are much more nuanced than the mainstream press’ focus on the impact of the strike on the kids (and their parents) who suddenly had no daytime adult supervision, and the notion of a protectionist teachers union. The labor movement: The debate resolution is accepted; the labor movement is a mess. Few would argue to the contrary. Union membership is at historic lows for the modern era and continues to decline. According to the Bureau of Labor Statistics, between 2010 and 2011, union membership of wage and salary workers dropped to 11.8 percent, a decline of 0.1 percent, but union membership among Asian-Americans fell from 10.9 percent to 10.1 percent, and for Latinos from 10.0 percent to 9.7 percent. Rarely discussed is the fact that union membership (13.5 percent) and union representation (15.0 percent) is highest – and growing – for black workers, particularly for black males (14.6 percent union members, 15.8 percent represented by unions). It seems to be common currency to dump on unions where membership is healthiest, (more than half of unionized workers are found in public sector jobs), and particularly the teachers unions, as though organized labor is somehow at the heart of most problems in private industry and the public sector. Teachers become a target because, by profession, education, training, and library occupations have the highest rate of union membership (36.8 percent in 2011, although that is down from 37.4 percent in 2010). It is a little obvious to see the confluence of factors – union membership on the decline, union membership higher in the public sector, union membership concentrated in education occupations, and union membership higher for blacks than whites – as a pattern that makes unions a vulnerable target when they stand up against proposals for some kinds of change. With nonprofit sector employment growing despite the recession, it makes sense that nonprofits would increasingly be areas of interest for union organizing, especially because, as the NPQ Newswire noted yesterday, there is an unfortunate strand in the nonprofit sector that excitedly promotes the notion of increasing CEO salaries, but shows scant interest in the sector’s dependence on below-living-wage (or even volunteer) labor. As a possible consequence, some nonprofit employers, particularly the larger ones in the health and education areas, have had to deal with intrepid organizing efforts by the likes of the Service Employees International Union and others. Are nonprofits seeing themselves as employers aligned with management? Are nonprofits buying into the story that conservatives, neoconservatives, and social entrepreneurs have used that casts unions as the almost-always bad guys? It feels like on union issues, particularly in education, the nonprofit sector hews toward the anti-union sentiments of Students First, founded by former D.C. schools chancellor Michelle Rhee, and Stand for Children, the latter running a petition against the CTU on the change.org website. Test scores: It is difficult to find education reformers defending the reliance on student test scores for the evaluation of teachers’ performance, though the student test score issue continues to be a default option in the school administrators’ reform platform. That stands in contrast to the continuing critique of the heavy reliance on student test scores in the research. The Washington Post’s education blogger, Valerie Straus, has published a couple of commentaries in the wake of the Chicago strike on the weaknesses of testing (this one, for example), but despite her using the academic literature to demolish Emanuel’s position on testing a better response might be an op-ed this week from Pulitzer Prize-winning Washington Post columnist Eugene Robinson. Linking this issue back to teachers and unions, Robinson is open to charter schools, but hardly sees them as a panacea. Remember as the Chicago Tribune noted, charter schools tend to be led by teachers who are more white than their overall public school counterparts – and who are generally not unionized. And frequently charter schools are managed by nonprofit organizations that are highly favored by the big education reform funders such as Gates, the Broad Foundation, and the Walton Family Foundation. In the NPQ Newswire, we quoted an equally powerful statement by Anthony Cody on the importance of understanding and dealing with issues of poverty in public school reform. Cody teaches in Oakland, but this author has been watching the educational process in the Washington D.C. public schools that have been educating his daughter for some years. If anything, despite a clunker of a teacher or two, our critique has been not of the teachers in these inner city schools, but of school administrators. Perhaps few remember, but in the New York City of Mayor Michael Bloomberg’s predecessors, one of the most important elements of educational reform was the reduction in bloat at 110 Livingston (where the New York City Department of Education was long headquartered). For anyone who has experience in local government dynamics, it is at the administration level where politics hold great sway, as the teachers unions have succeeded for the most part in protecting teachers against political meddling. Imagine the challenge facing teachers in some of the states where teaching to the test is teaching unscientific bunk on issues of evolution and intelligent design. Thank goodness that there’s a teachers union that will in most cases protect teachers against the kinds of political interference that would otherwise be rampant in public education. Emanuel, U.S. Secretary of Education Arne Duncan (who used to head the Chicago school system), and Emanuel’s former employer, President Obama, are all enthusiasts for privately managed charter schools. 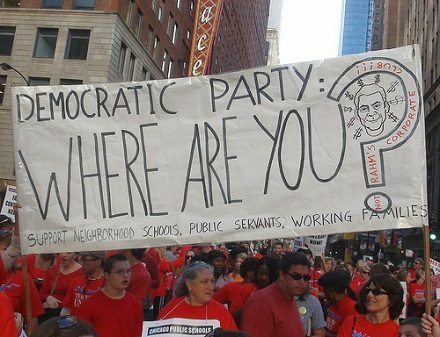 Although the president has done his best to steer clear of taking a position on the Chicago teachers, his Republican challenger has been enthusiastic in his support for Emanuel’s position in the controversy and called for more privatization of traditional public schools with charters and other alternatives. During Duncan’s tenure in Chicago, he authorized dozens of charter schools and promoted flexibility in management and curriculum. In truth, as the NPQ Newswire reported recently, observers find less distance between Obama and Romney on school issues than most – other than the fact that Romney’s program of budget cuts would enfeeble the federal government’s ability to do much with public education. A knee-jerk reaction to the strike would lead people to think that the Chicago teachers were fighting for wages, but that was actually not the case. It was the questionable focus on standardized testing as a significant part of the Emanuel formula for evaluating teacher and school performance. Class size was a big issue for the teachers. And it was teacher training, with the teachers arguing for more and better professional training for teachers in contrast to the increasingly popular notion in some parts of the nonprofit sector that several weeks of training for people with little or no background in education is sufficient for tossing them in front of large and challenging classrooms. The CTU’s position is consistent with the American Federation of Teachers program for bolstered teacher training. You don’t call for more, better, and more rigorous training if you don’t believe in doing the best for the education of kids. Nonetheless, the nonprofit sector hasn’t been particularly vocal in challenging the political and press orthodoxy of good education reform versus bad teachers unions. It isn’t just from nonprofits in general, but we haven’t seen much response to the continuing disparaging remarks about the teachers in the union and teachers themselves. We really don’t get it. If you know teachers working in the public school systems, you know that they work much longer hours than their nominal school day, working with kids, grading papers, generating new activities and exercises for their classrooms. They take out of their own pockets to pay for extra supplies and books for the kids. For every clunker, there are dozens and dozens of dedicated teachers who are arguing to be collaborative partners with city government and boards of education in improving educational outcomes for kids. In Robinson’s view, “portraying teachers as villains doesn’t help a single child.” Neither does portraying teachers unions as malevolent entities with no concern for the educational process and kids. Emanuel hired as his incoming school superintendent the head of schools from Rochester, N.Y. where he earned a 95 percent no-confidence vote from that city’s teachers, perhaps girding for a prolonged battle against the teachers union. A war against teachers and against their union, which gives them a collective voice, is unproductive at best. It’s time to end the war, and it’s time for nonprofits to stand up for teachers when they are being pushed into teaching-to-the-test for their own survival and pummeled for looking to their union to represent their concerns about public education.